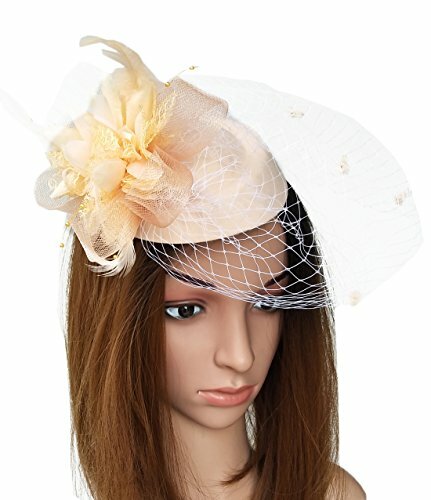 Flower Feather Headband Mesh Fascinator Tea Party Wedding Headwear Bridal Headpiece with Veil. Suit for parties, weddings, Christmas, New Years Eve, Derby, Easter and Church. Fascinators are women's best hats accessory in our humble opinion. They offer a beautiful hair accessory which is easily worn. 1. Item color displayed in photos may be showing slightly different on your computer monitor since monitors are not calibrated same. Hope understanding. 2. Please allow 1-3cm differences due to manual measurement, thanks. If you have any questions about this product by Coolwife, contact us by completing and submitting the form below. If you are looking for a specif part number, please include it with your message.